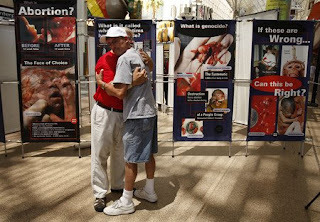 THE PASSIONATE PRO-LIFER TURNED ABOLITIONIST: Operation Save America Rocks "Sin City"! Operation Save America Rocks "Sin City"! Moments after praising a jubilant supporter, the Rev. Flip Benham gave a thumbs-up Thursday to the abortion opponents lining Flamingo Road near Spencer Street. A woman stepped through the protesters near the A-Z Women's Clinic, refusing to listen to their religious chants. "Jesus ain't done (expletive) nothing for me," she shouted, throwing up her hands. The issue that has polarized many people across the nation seemed to do the same on Flamingo Road on Thursday. Benham, a North Carolina resident and director of Operation Save America, the group gathered outside the abortion clinic, watched as the woman barreled along the sidewalk through what he called "a gauntlet of Christians." About 40 to 50 people participating in the so-called National Event gathered near the clinic, hoisting posters, chanting at motorists and pedestrians, and blaring anti-abortion messages at the building. Benham pointed his well-worn Bible in the direction of the clinic and said "If you think the back-alley abortion is over, it's not." A-Z Women's Clinic is a certified, private medical office. Dr. William Ramos of the clinic declined comment. A woman who answered the phone at the clinic said plainly about the protesters, "That's what they're looking for." Representatives from Acme Security waited outside the doors of the clinic, but the abortion opponents kept their distance. Thursday's protest was one of several events the national group planned through Wednesday in the valley. The group will take its message to the Fremont Street Experience and the six clinics that offer abortions in the valley, Benham said. Last week, Clinica de Mujeres, an abortion clinic at 3700 E. Charleston Blvd., was shut down after a complaint was filed and health department representatives investigated the facility. The investigators said the clinic was allegedly performing surgeries without a license and cited "a gross breakdown in infection control practices." Several people have claimed the initial tip against Clinica de Mujeres came from a member of Operation Save America. Benham wouldn't speak to Clinica de Mujeres' investigation but said he counted its closure as a victory. On Thursday, all of the participants, ranging in age from toddlers to adults, donned red T-shirts and waved posters of either smiling babies saved from abortion or dead fetuses. The latter image jarred Las Vegan Rick Scott so much that he got off the bus early to talk to a protester. He and Blair Powley of New York sparred with Bible verses about the issue of abortion. "We agree to disagree on some points," Scott said. "I don't think this is the right way (to spread the message)." He disagreed with the group's methods of using shocking imagery but said he was fine with them being outside abortion clinics as long as they didn't harass women seeking the procedure. Powley said he appreciated Scott's points and said people often are combative about the images. "They show pictures in schools of the many people killed in the Holocaust and civil wars," he said. "Children look at these posters and say, 'That baby is hurt.' It's more the parents that are offended." Benham said confrontations go hand-in-hand with Operation Save America's events but he believes their battle is won "on the streets." A minor car accident occurred in front of the protest, but Las Vegas police said the drivers were not distracted by the people. Traffic was not affected, and there were no injuries. Contact reporter Maggie Lillis at mlillis@reviewjournal.com or 702-383-0279.